Malawi continues receiving hundreds of refugees from Mozambique, six months after RENAMO fighters carried out two attacks in Tete province. The fighting in July forced more than 700 people into Malawi, and refugees say they continue to flee atrocities and killings by militias. 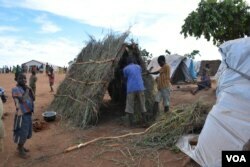 Refugees are entering daily at the newly established Kapise ll camp in Malawi's Mwanza district. It is home to more than 2,500 refugees. Refugees tell stories about people they believe are FRELIMO government fighters torching their houses and killing their relatives on suspicion of hosting RENAMO fighters. Flora Emberson is one of them. “My uncles’s son was shot dead just a few meters from where I was. When I rushed to see what had happened, he could not speak and was almost dead. I did not hesitate, but run way for safety,” she said. Camp supervisors say they register almost 40 refugees a day, many women and children. Camp residents say they have not received food aid since mid-December. One of the refugees, Elena Limited, says life is tough. “We do not have clothes, blankets and food. Although we are constructing makeshift shelters, we do not have any protection from the rains, and our fear is that it will be another trouble when the rains come,” she said. Many survive by working in nearby maize gardens or turning maize husks into flour for cooking porridge. But the refugee influx worries villagers near the camp. “We are staying with these people in the village, yes, but we are living in fear because we believe that in time they will completely run out of food, they will start stealing from us in our homes,” says William Mitiwe, the headman at Kapise ll village. The villagers also fear some of the refugees might have run with weapons that can be used against them. 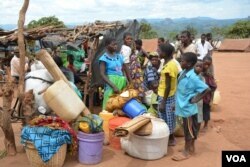 Mozambican authorities reportedly said those fleeing into Malawi are either thugs or lazy people. But refugee Jaleo Bernaldo denies this. Malawi government authorities say they are trying to work with their Mozambican counterparts on how best to address the issue. Meanwhile, international bodies are helping out. Doctors Without Borders is providing medical help. The United Nations has provided some tents and has established a children's counseling center, where children also sing songs to help relieve them of trauma due to running away from home. Malawi previously hosted Mozambicans who fled a 16-year civil war between 1977 and 1992.